This product requires the base game Slime-san. The notorious Blackbird's kracked, I mean, cracked! He believes Slime-san stole his treasure and unleashed his giant Kraken upon him! Sound familiar? It is now up to Slime-san to escape the giant squid's jaws back out to freedom! A totally independent campaign from Slime-san! Are you ready for an aquatic adventure? 25 normal and 25 NG+ levels within a giant kraken! 200 Bananas to collect and spend in gameplay, clothing and furniture shops! A customizable house that you can style and furnish to your heart's content! Unlock different play styles and outfits! Exciting new mechanics like the submarine mode, acid bubbles and suction cups! Extensive settings to tinker with to customize your gaming experience! Slime-san is the fourth major game developed by Fabraz. The three previous titles being Planet Diver, Cannon Crasha and Wild Wild Pixel. Slime-san is a game that is fun down to its very core. A silly story, with an unlikely character and gameplay that is addictively fast. It features hours of single player content yet is tailored for speed runners as well. The very core mechanics and level design lend themselves to be played competitively online. It is a visually unique adventure using a carefully crafted, 5 color palette world that is filled with fun and goofy Japanese references. It also has a soundtrack that is worth the price alone, featuring some of the most popular chiptune composers in the world! Published by Headup Games. 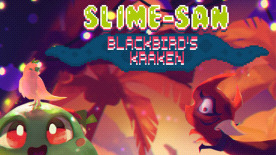 Disclaimer: When you already own “Slime-san” you do not need to buy “Slime-san: Blackbird’s Kraken”. The original “Slime-san” gets updated automatically and will already include the Blackbird’s Kraken-DLC!